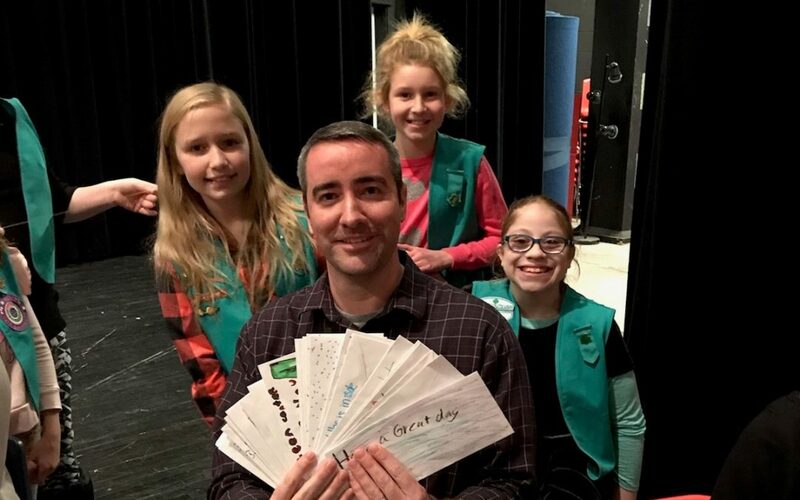 Members of Girl Scout Troop 4455 present Mr. Hamilton with a gift raised for youth who attend The Depot. The young ladies raised money while working for a badge, “I, Team, Community”. The thought behind the badge is that one person might have an idea of how to do something good, that is the “I”. If that person asks for help and adds a “Team” (or a troop), how much more can be accomplished and how much greater impact can they have for their community. As the Troop thought of things they could do for the community, they thought of kids that attend The Depot and are hungry but have no money. As they considered this need, they came up with a goal that each member of the Troop could raise a dollar for a kid that needed a dollar to buy some food at The Depot. The Troop, a team working together on an idea to help the community, raised $104. Congratulations on your project and thank you for providing for kids in need! Pictured left to right: Emma Vanderhoof, Matt Hamilton (Depot Vice President), Lily Snyder, and Olivia Perrault.